US Presidential Election will be November 6, 2012, and it's pretty soon. By looking at the corporate sponsors of Democratic President Obama and Republican candidate Romney, there is not much difference on who you cast a vote. 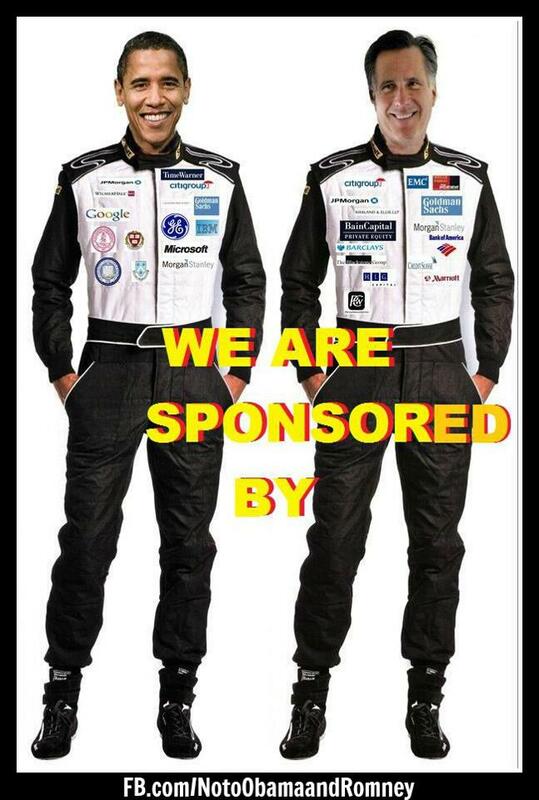 Both candidates are sponsored by big banking corporations, such as Citigroup, JP Morgan, Goldman Sachs, and Morgan Stanley. Either candidate will continue bailing out banking industries. Some resources say these central banks are supplying funds for war industries. So wars will continue with either candidate for at least another 4 years. President Obama is sponsored by GE. GE is a big conglomerate for Defense (war) industries and nuclear power plants. No wonder he approved new construction of 2 nuclear power plants last February. He is the first US president to do so in 34 years. I watched What's at Stake: PBS Election 2012 on PBS channel last Friday, 11-2-2012. It stated National debts is over $16 trillion and 20 million Americans are unemployed right now. Over 80 corporate leaders urged Obama administration last month to do something to Economy, otherwise, many companies will go bankrupt by the end of year, and another 2 million people will be unemployed at January 1-2013. Millions of baby boomers will turn 65. Fixing Meicare is becoming more difficult. Experts say Midicate will only be able to pay expenses only for another 12 years. The number of seniors will double by year 2030. Neither candidate provides successful solutions to these issues. 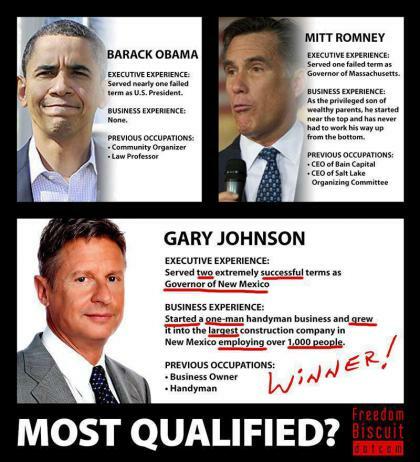 Here are job experiences of President Obama, Governor Romeny, and Govenor Gary Johnson (Libertarian candidate). Gary Johnson doesn't get much spotlights, but he is most qualified to be a president. He served as a New Mexico governor from 1995 to 2003, two terms, successfully. He turned the state deficit from over $1 billion surprise during his terms. Johnson was not going to win the Republican nomination, so he is running as Libertarian presidential candidate. As the same principles as Ron Paul, he is against wars and FRB. He wants to abolish IRS, and there will be no income taxes. He is aiming a small government. Your vote for Obama or Romeny will send more American troops to wars. Both of them are getting funding from central banks. These central banks are sending funds to defense (war) industries. On average, 18 American soldiers a day commit a suicide from war trauma. The best medicine is marijuana. But both Obama and Romney do not allow marijuana and continue regulating it.